McCandlish Design is the contributing designer for today’s House Calls article in The Washington Post. The challenge was to turn an incohesive space into a welcoming and functional room for a young family. 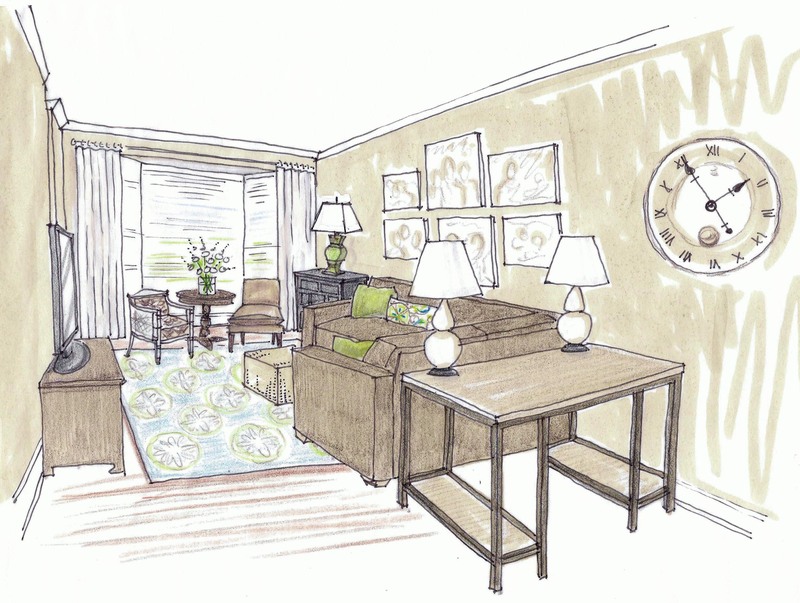 The family’s living room wore many hats: living room, family room, play room, and home office. In order to provide more seating, I swapped out their existing sofa for a larger sectional. I positioned the desk so that it backed up against the sectional, creating a physical and visual barrier between the living room and “home office” while hiding the computer and its components. Now the desk serves as a sofa table also, holding two attractive lamps, and its shelves and clutter are sheltered from view when you walk in the room. In order to give some additional storage for toys, I added a chest with multiple drawers. The existing ottoman was too large and was in the way of the path through the room. So I swapped it for a smaller ottoman that has storage and can still serve as additional movable seating when needed. The family had its television resting on a bureau which provided no storage for the A/V equipment; I included a new TV cabinet with glass that will hold all of the equipment and games while still providing remote control access. Because the kids are young, the fabrics and finishes needed to be practical. The sectional is a dark brown velvet; the color will hide a multitude of sins, and velvet has great abrasion resistance. The indoor-outdoor rug adds color, hides stains, and it can be rinsed off with a hose! All of the new casegoods have an old, weathered look, so a few nicks and scrapes will blend in. The existing arm chair is recovered in a brown animal print. The animal print keeps the formal chair from feeling too stuffy, and the print will hide stains well. The existing paint color was a pale, frosty blue. It felt cold to me, so I instead suggested a warm putty color that will provide a warm, neutral tone to the space without feeling too heavy. The Post‘s rendering shows the grey as darker than it is in reality. And in order to let in more light while also accentuating the ceiling height, I moved the draperies outside of the bay window and chose clean off-white panels hung on a simple drapery rod. The Post didn’t mention my artwork suggestion which is to have several family photos, all different sizes, printed in sepia tones on stretched canvas. Changing the color to sepia ties the artwork in with the rest of the room and turns their photos into art. This entry was posted in Design Advice, Design Examples, Uncategorized and tagged living room, makeover, The Washington Post. Bookmark the permalink. Sounds like it looks really nice. I’m not a fan of blue walls either and would be quick to hurry up and paint over them. I personally prefer neutral colors with a modern look. Although it all depends on the house and where its located. I’m from the country and love the rustic country feeling. But if I lived in the city I would much prefer an up to date modern look. Keep up the good work.